Use energy to Run Missions to get money and level up. 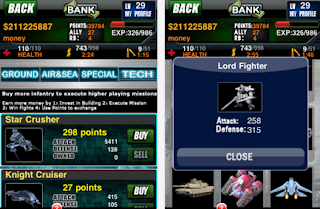 Most missions require items that can be purchased from the weapons store by simply tapping the required weapons icon. Some missions will also require large alliance size. You can build your alliance by adding alliance members in the VIP AREA or by yourself in the VIP area- This is a great way to grow your alliance quickly! Master a missions by running a missions multiple times. Completing all 4 mastery ranks of a missions will unlock money, experience points . Power up chest keys, and powerful items. All missions have a chance of attaining loot items. Loot items are the most powerful items in the game. You have a 20% chance of obtaining loot when you complete a missions. Higher level missions have a 10 % chance of obtaining loot when you complete a missions. When ﬁghting you will attack with 10 alliance members times the highest level participant in the ﬁght. example: if you are a level 48 player with 600 alliance members and you attack a level S2 player you will ﬁght with 520 alliance members. If you have less alliance members than the sum of highest level participant in the ﬁght x l0 you will ﬁght with all of your alliance members. You will be able to see how many alliance members a enemy ﬁghts with in the alliance icon in a ﬁght result. points and when defending you ONLY use your defense points. Your attack points and your enemy defense points can be viewed next to their alliance size in a ﬁght result window. You can equip each active alliance member(remember active alliance member is equal or lesser than you’re the highest level ﬁght participant x l0 with one weapon one gear and one vehicle. Example if you are a level 20 with 200 alliance you attack a level 26 you will ﬁght with 260 of best weapons, gear, and vehicles. During a ﬁght the game will equip your alliance with your best available weapons The game will choose the best weapons by their attack and defense rating. If you initiate a ﬁght you will use ONLY your best attack rated weapons. When you defend you will use ONLY your best rated defense weapons. To be fully maxed out on weapons you must have weapons with the highest attack ratings AND the highest defense ratings.